Background: A sensation of vibration is experienced during audible 'OM' chanting. This has the potential for vagus nerve stimulation through its auricular branches and the effects on the brain thereof. The neurohemodynamic correlates of 'OM' chanting are yet to be explored. Materials and Methods: Using functional Magnetic Resonance Imaging (fMRI), the neurohemodynamic correlates of audible 'OM' chanting were examined in right-handed healthy volunteers (n=12; nine men). The 'OM' chanting condition was compared with pronunciation of "ssss" as well as a rest state. fMRI analysis was done using Statistical Parametric Mapping 5 (SPM5). Results: In this study, significant deactivation was observed bilaterally during 'OM' chanting in comparison to the resting brain state in bilateral orbitofrontal, anterior cingulate, parahippocampal gyri, thalami and hippocampi. The right amygdala too demonstrated significant deactivation. No significant activation was observed during 'OM' chanting. In contrast, neither activation nor deactivation occurred in these brain regions during the comparative task - namely the 'ssss' pronunciation condition. Conclusion: The neurohemodynamic correlates of 'OM' chanting indicate limbic deactivation. As similar observations have been recorded with vagus nerve stimulation treatment used in depression and epilepsy, the study findings argue for a potential role of this 'OM' chanting in clinical practice. Vagal nerve stimulation (VNS) is used as treatment in depression and epilepsy. , A positron emission tomography (PET) study  has shown decreased blood flow to limbic brain regions during direct (cervical) VNS. Another functional magnetic resonance imaging (fMRI) study  has shown significant deactivation of limbic brain regions during transcutaneous VNS. In this procedure electrical stimulus is applied over the inner part of the left tragus and hence the auricular branch of the vagus. Healthy volunteers (n=12; nine men) who were right-handed and were consenting to participate as controls in an ongoing MRI research were approached. Two qualified psychiatrists independently assessed these volunteers to exclude: 1) Psychiatric diagnosis, 2) family history of major psychiatric disorder in first-degree relative, 3) pregnancy or post-partum, 4) co-morbid substance abuse or dependence, 5) significant neurologic disorder, 6) any contraindication for MRI and, 7) left/mixed handedness. The absence of psychiatric diagnosis was established using Mini International Neuropsychiatric Interview Plus. The age range of the subjects was 22-39 years (mean±SD=28±6 years). All were literate. Four of these had formal training in yoga including meditation and the rest were naοve to this technique. The NIMHANS ethics committee had cleared the experimental protocol. In addition to the consent that they had already given for the ongoing imaging study they were provided with additional information about the present research (fMRI) and the need to be trained to chant 'OM' prior to the fMRI test. Written consent was obtained from all subjects for this study. All the subjects were trained in 'OM' chanting by an experienced yoga teacher. The subjects were trained to chant 'OM' without distress and interruption - the vowel (O) part of the 'OM' for 5 sec continuing into the consonant (M) part of the 'OM' for the next 10 sec. While earlier electrophysiological studies used mental 'OM' chanting, loud chanting of 'OM' was chosen in this study. This helped to objectively confirm the task performance during fMRI as well as to provide the vibration sensation and stimulate vagus nerves via the auricular branches thereof. The control condition was continuous production of 'sssss….' syllable for the same duration (15 sec). This was chosen to control for the expiratory act of chanting 'OM' but without the vibratory sensation around the ears. These practices were achieved in a supine posture. They were familiarized with the same procedure while lying in the MRI console. Once they were comfortable, the fMRI procedure was conducted. At the end of the task, one of the investigators ascertained if the subjects experienced a vibration sensation while chanting 'OM' but not "ssss". The fMRI procedure had a block design. The fMRI experiment consisted of the following phases: 1) a high-resolution structural brain scan was first performed; 2) this was followed by echoplanar imaging (EPI) sequence in which blood oxygen level-dependent (BOLD) scans were performed. The EPI scans had a repetition time (TR) of 3 sec. Two hundred EPI scans were performed over 10 min. These 10 min consisted of 15-sec blocks of 'OM' and "ssss". These blocks were interspersed with 15 sec of rest period. Altogether there were 10 blocks of 'OM', 10 blocks of "ssss" and 20 blocks of rest [Figure 1]. Imaging was done using 3 Tesla MRI scanner at NIMHANS. After the initial localization sequences, high-resolution T 1 -weighted, structural MR images of 1-mm slice thickness with no inter-slice gap were obtained (TR=8.1 msec; TE=3.7 msec; matrix=256΄256). This high-resolution structural image was utilized for the purpose of localization of brain activation and also to rule out any gross brain abnormality in the study subjects. This was followed by a BOLD sensitive EPI sequence (TR=3000 msec; TE=35 msec; slice thickness=8 mm; number of slices=16; matrix=128΄128). The total duration of EPI scans was 10 min. 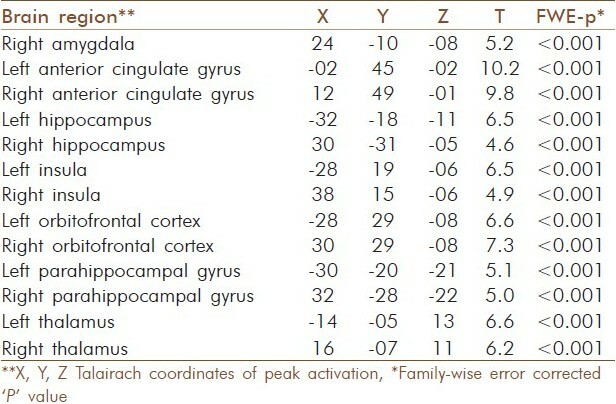 During the EPI scans, the subjects were cued to alternate among various states (i.e., 'OM', "ssss" and "REST") every 15 sec (as described above) through a MRI-compatible monitor display which was synchronized with the image acquisition by e-prime software incorporated in eloquence fMRI hardware setup. 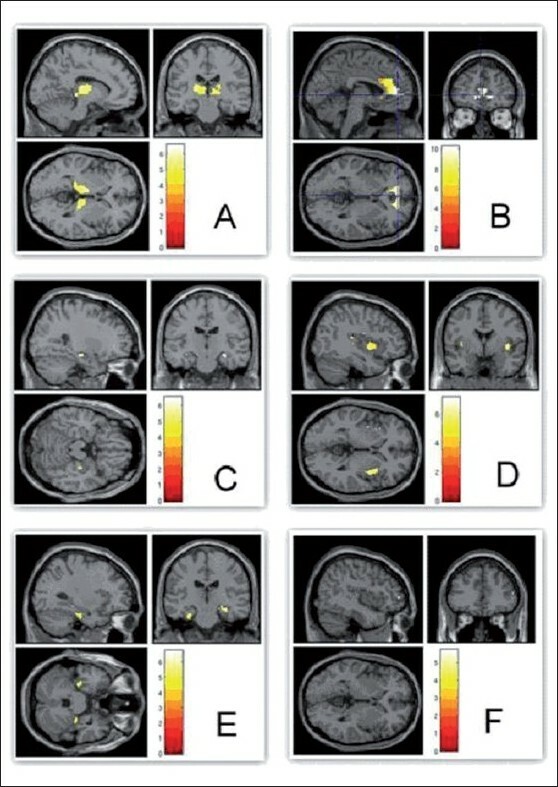 fMRI analyses were carried out for all patients using Statistical Parametric Mapping 5 (SPM5) ( http://www.fil.ion.ucl.ac.uk/spm ). Images were realigned, corrected for slice timing variations, spatially normalized ,, and smoothened with a Gaussian kernel of 8-mm full-width-at-half-maximum. The blocks were modeled by a canonical hemodynamic response function. SPM5 combines the General Linear Model and Gaussian random field theory to draw statistical inferences from BOLD response data regarding deviations from the null hypothesis in three-dimensional brain space. The voxel-wise fixed effects analysis produced a statistical parametric map in the stereotactic space of the Montreal Neurological Institute  . 'OM' as well as "ssss"-related BOLD-activation and de-activation, were assessed using a subtraction paradigm by respectively contrasting with the "REST'' condition. The BOLD changes were examined specifically in the ΰ priori regions-of-interest, namely the limbic brain regions [amygdala, hippocampus, parahippocampal gyrus, insula, orbitofrontal and anterior cingulate cortices and thalamus - the last three brain regions were examined because of their intricate connections with the limbic brain]. For these ΰ priori regions-of-interest masks were created using the WFU Pick Atlas More Details for SPM analyses. Significance corrections for multiple comparisons for the individual region-of-interest were performed using a Family-wise Error Correction (FWE) [P<0.001]. In this study, significant deactivation was observed bilaterally during 'OM' chanting in comparison to the resting brain state in orbito-frontal, anterior cingulate, parahippocampal gyri thalami and hippocampi. In addition the right amygdala demonstrated significant deactivation. No significant activation was observed during 'OM' chanting. In contrast, neither activation nor deactivation occurred in these brain regions during the comparative task - namely the 'ssss' condition. Though there is no previous report on the effect of 'OM' chanting on brain hemodynamic responses, an earlier study by Kraus et al.,  had examined the impact of transcutaneous VNS on BOLD changes using fMRI. Because of the commonality of the vagus involvement (as hypothesized in the current study), we compared our study observations with this earlier study. Interestingly, our study findings are in tune with this previous study; significant deactivation was observed in the amygdala, parahippocampal, hippocampal brain regions. This suggests that neurophysiological effects of 'OM' chanting may be mediated through the auricular branches of the vagal nerves. Using a different methodology (positron emission tomography), other researchers  demonstrated reduced blood flow bilaterally in the hippocampus, amygdala, and cingulate gyri following left cervical VNS in epilepsy patients. Similarly, VNS treatment in depressed patients reduced regional cerebral blood flow in the amygdala, left hippocampus, left subgenual cingulate cortex, left and right ventral anterior cingulum, right thalamus and brainstem as measured by single photon emission computed tomography. Interestingly, these regions become hyperactivated in patients with depressive disorder  for which VNS is used as therapy. However, our observations to support VNS as the mechanism of 'OM' chanting are preliminary and further studies are required to support our hypothesis. Alternatively, 'OM' chanting may have been a cue to relaxation. As meditation is shown to activate structures involved in relaxation response, namely cingulate cortex, dorsolateral, prefrontal and parietal cortices, hippocampus and temporal lobes,  the confounding effect of relaxation could not be ruled out. In summary, the hemodynamic correlates of 'OM' chanting indicate limbic deactivation. Since similar observations have been recorded with VNS treatment used in depression and epilepsy, the clinical significance of 'OM' chanting merits further research. This study was supported by the Innovative Young Biotechnologist Award grant to Dr. G. Venkatasubramanian awarded by the Department of Biotechnology, Government of India. 1. Nahas Z, Marangell LB, Husain MM, Rush AJ, Sackeim HA, Lisanby SH, et al. Two-year outcome of vagus nerve stimulation (VNS) for treatment of major depressive episodes. J Clin Psychiatry 2005;66:1097-104. 2. Jobst BC. Electrical stimulation in epilepsy: Vagus nerve and brain stimulation. Curr Treat Options Neurol 2010;12:443-53. 3. Henry TR, Bakay RA, Pennell PB, Epstein CM, Votaw JR. Brain blood-flow alterations induced by therapeutic vagus nerve stimulation in partial epilepsy: II, prolonged effects at high and low levels of stimulation. Epilepsia 2004;45:1064-70. 4. Kraus T, Hosl K, Kiess O, Schanze A, Kornhuber J, Forster C. BOLD fMRI deactivation of limbic and temporal brain structures and mood enhancing effect by transcutaneous vagus nerve stimulation. J Neural Transm 2007;114:1485-93. 5. Kumar S, Nagendra H, Manjunath N, Naveen K, Telles S. Meditation on 'OM': Relevance from ancient texts and contemporary science. Int J Yoga 2010;3:2-5. 6. Sheehan DV, Lecrubier Y, Sheehan KH, Amorim P, Janavs J, Weiller E, et al. The Mini-International Neuropsychiatric Interview (M.I.N.I. ): The development and validation of a structured diagnostic psychiatric interview for DSM-IV and ICD-10. J Clin Psychiatry 1998;59:22-33;quiz 4-57. 7. Friston K, Ashburner J, Frith CD, Poline JB, Heather JD, Frackowiak RS. Spatial registration and normalization of images; 1995. 8. Venkatasubramanian G, Hunter MD, Wilkinson ID, Spence S. Expanding the response space in chronic schizophrenia: The role of left prefrontal cortex. NeuroImage 2005;25:952-7. 9. Venkatasubramanian G, Spence SA. Schneiderian first rank symptoms are associated with right parietal hyperactivation: A replication utilising fMRI. Am J Psychiatry 2005;162:1545. 10. Evans A, Collins DL, Mills SR, Brown RD, Kelly RL, Peters TM. 3D statistical neuroanatomical models from 305 MRI volumes. IEEE Nucl Sci Symp Med Imag Conf Proc 1993;108:1877-8. 11. Maldjian J, Laurienti PJ, Kraft RA, Burdette JH. An automated method for neuroanatomic and cytoarchitectonic atlas-based interrogation of FMRI data sets. Neuroimage 2003;19:1233-9. 12. Talairach P, Tournoux JA. A Stereotactic Co-Planar Atlas of the Human Brain. Thieme; 1988. 13. Zobel A, Joe A, Freymann N, Clusmann H, Schramm J, Reinhardt M, et al. Changes in regional cerebral blood flow by therapeutic vagus nerve stimulation in depression: An exploratory approach. Psychiatry Res 2005;139:165-79. 14. Malhi GS, Lagopoulos J, Ward PB, Kumari V, Mitchell PB, Parker GB, et al. Cognitive generation of affect in bipolar depression: An fMRI study. Eur J Neurosci 2004;19:741-54. 15. Lazar SW, Bush G, Gollub RL, Fricchione GL, Khalsa G, Benson H. Functional brain mapping of the relaxation response and meditation. Neuroreport 2000;11:1581-5.